When making a flavor of ice cream, we do our best to find local, in-season ingredients. All of our milk and heavy cream come from the beautiful and well-cared for Jersey cows at Mapleline Farm in Hadley, MA. No stabilizers, no growth hormones. Just the good stuff. We make all of our ice cream completely from scratch. 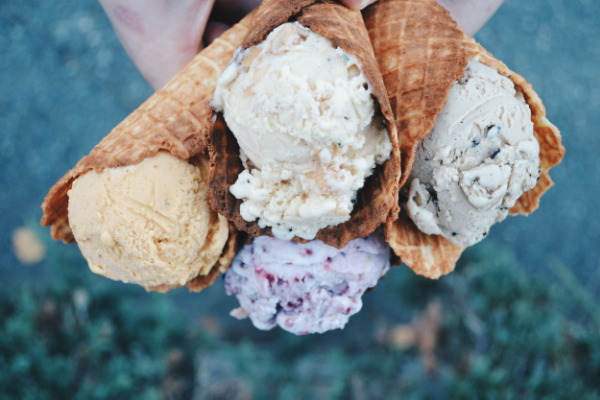 This means that we pasteurize our own base and are able to customize each ice cream flavor the way that we want. There is only a handful of ice cream shops in the country that do this; our flavors are truly ours and only for our customers. Our flavors are born from our imaginations. They're unique; we hope they inspire our customers to try new flavor combinations and experience ice cream in a way they never have before. By keeping our batches of ice cream small, each scoop and each pint is different from the next. Honeycomb Creamery was started in 2015 by husband and wife, Rory Hanlon and Kristen Rummel. Kristen spends a lot of her time cooking, baking and churning to create the beautiful, unique flavors for all of the ice creams and waffle cones. Through her studies at Cambridge School of Culinary Arts and her work as kitchen manager at Union Square Donuts, she has cultivated a love for unique, inspiring and delicious food. Rory spends a lot of his time baking waffle cones until they're perfectly caramelized and crisp, then hand rolling them into their beautiful, classic shape (and occasionally into taco shells because ice cream tacos are an important part of life). When he's not making waffle cones, he works a full-time job putting his business degree from Northeastern University to good use. They both spend the rest of their time (and then some) at pop-ups, festivals and farmers markets, chatting with customers and scoopin' ice cream.